Poor registration between the positive and the print is one area that has caused screen printers problems for years. This how to guide looks at some of the most common causes of miss-register that can occur during screen making. William Shorter, product manager, CPS explains. Unfortunately though there are many factors which can affect the dimensional accuracy/ reproduction capabilities of the screen and often a miss-register in the print is caused by several factors, making it hard to track down the root cause. There are three main causes of screen dimensional accuracy problems. Mesh is obviously flexible, therefore if there are any differences in mesh tension from when it was imaged to when it was printed, there will be a difference in size. For example; a thick, multi-layer film positive will cause the mesh to deform around it during vacuuming down for exposure, this will actually stretch the mesh when it is imaged which will then shrink back once the vacuum pressure is released. The same effect can be seen if the frame profile does not allow the mesh to lie perfectly flat against the exposure glass. Unexpected mesh stretching can also occur if the vacuum blanket is very tacky. In some cases it can actually pull the mesh/stencil outwards as it is vacuumed down. This problem can be identified and subsequently overcome by simply placing a black cloth/card between the mesh and the blanket to break any seal. Although these effects are very small they can cause up to 0.5mm (500µm) distortion over a 1m image. Mechanical distortion is also caused during the printing process itself, as unless you are printing on-contact then the off-contact distance will cause the image to grow slightly. In most cases though this is not noticeable as long as the off-contact distance remains constant for all the screens used for the job. Temperature differences can have a noticeable effect on the size of aluminium frames, which can then lead to registration problems. For example; a 1x1m aluminium frame is coated, dried at 40°C and then immediately exposed. 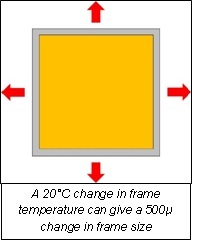 If it is then allowed to cool to room temperature (20°C) and printed, the frame will have shrunk by 500µm (0.5mm) in both directions. As the image was ‘locked in’ at the higher temperature size the image on the screen at 20°C will be noticeably smaller. The solution to this problem is simple; always expose and print at the same frame temperature. For critical applications having the same ambient temperature in the screen making area and the print shop, and allowing the frames to return to room temperature after both drying cycles will easily control this variable. It is not just aluminium frames that are affected by temperature, many substrates will change size when they are heated, so it is critical that temperature sensitive substrates are pre-shrunk prior to printing. Even stable substrates such as polyester will shrink if they are exposed to high enough temperatures, hence the need for heat stabilised polyester for printed silver conductive inks. Most substances absorb water, some a lot more than others. As a rule of thumb the more water that a substance absorbs, the more it will expand. Paper is a perfect example as that changes size significantly as it picks up, or loses moisture, hence the need to pre-condition paper stocks before printing. But what about wooden frames that are imaged while the wood is still damp from the degreasing stage and then printed a week later when they have totally dried out? As you can see from the above, registration problems are typically caused by differences in tensions, temperatures or moisture contents. These can be differences between screens in a set or between stages in the process. Most of these effects are very small, but they can all add up to cause a noticeable registration difference. If you are faced with a registration issue in your print shop, the first thing is to take a step back and look at the whole process, look for these differences and methodically rule out, or control the variables at each stage.